Kodak Catholicism forms part of my restless search for the ultimate iconographic woman – the Virgin Mary. Through Kodak Catholicism, I was hoping to capture “miraculous” imagery with my camera, so I gave myself permission to go beyond what I thought might be camera optics and perceptual illusion. I became influenced by believers who told me the Virgin Mary herself called me to do this project. Amazingly, shortly after a pilgrimage to Aylmer, Ontario, I found an abandoned religious plate on a park bench. The plaque read “I prayed for you in Fatima, Portugal” and bared an embossed metal image of the Virgin Mary. 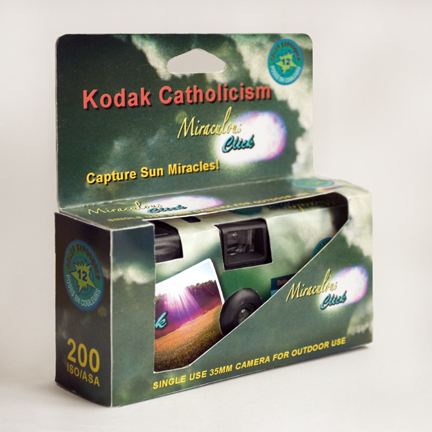 Kodak Catholicism has taken the form of a photo blog, which invites you to view the project album, share photos of your own, and engage in discussions of photographic miraculous phenomenon. This project was produced by Teresa Ascencao, was named after Jessy C. Pagliaroli’s essay Kodak Catholicism, and made possible through the generous support of the Toronto Arts Council.